What Are Mirrorless Cameras, and Are They Better than Normal DSLRs? Recently, popular photographer Trey Ratcliff said he’s done buying DSLR cameras because mirrorless cameras are the future. Let’s take a look at what these cameras are, and see if Trey is onto something, or just full of hot air. Today, we’ll be learning a bit about the history of cameras, what “mirrored” cameras are, and how this new generation of cameras fits into the history of photography and the development of better and better equipment. Keep reading to decide for yourself—is Trey on the money, and DSLR is actually dying? Or are these “mirrorless” cameras destined to be the Betamax of modern camera technology? Some years ago, when photography was first brought to the masses, cameras were very simple objects. They had a shutter that blocked light, and a photosensitive material that reacted to light when that shutter opened. The problem with this very simple design was that it was impossible to see what you were about to expose, and therefore very tough to compose a good shot. If you’ve ever seen or experimented with pinhole cameras, you’ll know what this is like—it’s mostly guesswork. Later generations of cameras had viewfinders for photographers to look through to compose their images, but this viewfinder was a completely different lens than the one that focused light on the film. Since you were composing with one lens and shooting with another, this created a parallax. Simply defined, a parallax with this type of camera, called a twin lens reflex, means that what you see isn’t what you get. In order to solve this problem, camera engineers had to design a machine that was capable of allowing photographers to see and expose through the same lens. Single lens reflex, or SLR cameras were the answer to the parallax problem. With a clever mechanism of moving parts, SLR cameras reflect the light coming through the lens to optical viewfinders (and to the eye of the photographer). 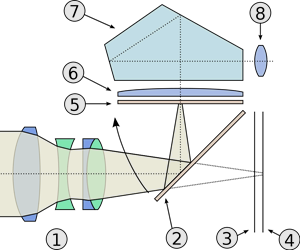 When the shutter release button is pressed, the mirror moves, and that same light through the same single lens is allowed to expose the image on the photosensitive film. As SLR cameras evolved, a few trends started to take place. Cameras started to normalize layouts—shutter advances, shutter releases, and film storage all moved to similar locations, despite the manufacturer. And 35mm film became the de facto format for professional and home use—with some exceptions, obviously. Eventually the professional photographers got interchangeable lenses, all with standard lens mounts and lenses tuned to the format of that specific camera. What this meant was that a photographer could carry a single camera body and exchange lenses to shoot a variety of situations, and the camera companies had a whole new line of products to develop, manufacture, and sell to consumers. In this age of 35mm film photography, most home photographers likely would not need the versatility of interchangeable lenses, and opted instead for more compact and simpler point and shoot cameras with permanent lenses. Even today, this same two market approach to camera design is obvious. As we’ve discussed before, digital cameras use photosensors in place of old-fashioned film to detect and record light coming in through a focused lens. Using this same single lens model (in general), digital cameras have (obviously, duh) transformed how we take pictures today. Let’s briefly talk a little bit about how. Digital Single Lens Reflex, or DSLRs, as they’re branded, have continued the tradition of interchangeable lenses, but have the additional added benefits of through the lens metering (reading the available light through the main lens) and auto shooting modes, allowing (to the chagrin of many photographers) users to take better pictures without having much knowledge of the art or science of photography. In addition, digital cameras allow for a shorter feedback loop for those of us hoping to actually learn more. This means that we can instantly learn if a photo is bad or good, and make changes on the fly. In the past, changing ISO more or less meant changing a whole roll of film, and learning what you shot wrong took developing a whole roll and starting over if you made a mess of it. Many modern point and shoot cameras have viewfinders with separate lenses, so we come back to the problem with parallax. However, these fixed lens, point and shoot cameras cleverly use the same lens and sensor to create an image on an LCD screen, replacing the optical second lens viewfinder altogether. This development is what allows the so-called “mirrorless” cameras to be mirrorless. Mirrorless Cameras Are Here! Are They The Future? Unlike a lot of innovations in digital imaging, mirrorless cameras are already commercially available. We aren’t going to mention any particular brands—we’re not making equipment recommendations or endorsements today—but there are several companies currently making high quality mirrorless digital cameras. For readers interested in sharing their experience with their own mirrorless cameras, feel free to make some noise in the comments section, and let us know what brands and cameras you’re enjoying. What makes these mirrorless cameras truly different from both DSLR cameras and modern point and shoot digital cameras is a sort of “best of both worlds” scenario. Because the design is mirrorless, the camera body is much simpler, smaller, and easier to carry. And because the camera body has been designed differently, the lenses for these cameras are also simpler and smaller to manufacture. This allows for smaller, high quality lenses to be made at lower costs. Eventually, some of that savings is bound to be passed on to the consumer, if it isn’t already. And because this new generation design incorporates interchangeable lenses, photographers will be able to use the lens appropriate to the situation—a must to attract the professional crowd. Like the point and shoot cameras, mirrorless cameras use the LCD screen in place of an optical through-the-lens viewfinder. The advantage of that is obvious—photographers get a larger, more accurate idea of what their final image is going to look like, even before the image is recorded. However, consumers that insist on using the optical viewfinder will find that they aren’t happy with the parallax, or being forced to use the LCD screen to compose. When you look at the overall trend of technology improvements over the years, it does sort of make sense that these mirrorless, or, as Trey calls them, “3rd generation” cameras, would be the future of digital photography. 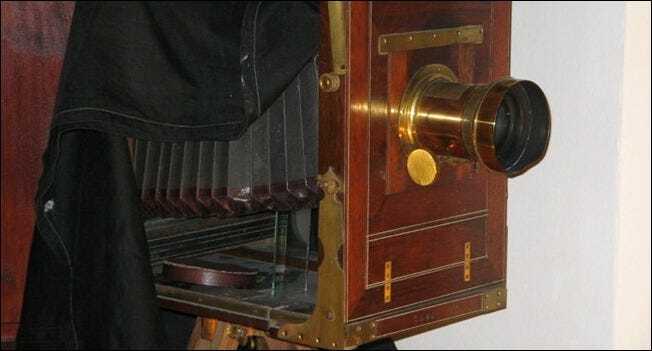 Mirrors in single reflex cameras were an engineering feat from the late 19th to early 20th century to solve the problem of parallax without exposing film. With today’s technology, it’s simple to use one lens to create a preview of an image on an LCD, solving the parallax problem in a much more modern way. Is this way inherently better? Depends on whom you ask. Are DSLRs on the way out? It might not be as cut and dry as Trey lays it out, despite his very reasonable points. It may depend more on marketing and the reaction of camera buyers, and the amount of resources camera manufacturers will put behind this generation of mirrorless interchangeable lens cameras. You might draw a parallel to photographers buying “mirrorless versus DSLR” to “Betamax versus VHS”, or “Blu-Ray versus HD-DVD.” It’s a complicated question, and even if some photographers or experts call the fight, if camera companies can’t convince their customers that mirrorless is truly the future of professional digital photography, it never will be, despite any advantages. What’s your take on the Mirrorless Interchangeable Lens, aka 3rd Generation cameras? Will they have to pry your digital SLR out of your cold, dead hands? Tell us about your thoughts on the topic, one way or the other, in the comments section below. Image Credits: PENTAX Q (mirrorless) by Jung-nam Nam, Creative Commons. Old studio camera Alter Studio Fotoapparat by Janez Novak, GNU License. Twin Lens Camera in public domain. Rolleiflex medium format camera by Juhanson, GNU License. 1957 Kodak Duaflex IV by RAYBAN, GNU License. Pleasure, little treasure (top) by Javier M, Creative Commons. 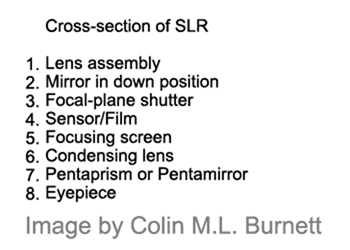 SLR Cross section by Colin M.L. Burnett, GNU License. Sensor Klear Loupe by Micheal Toyama, Creative Commons. 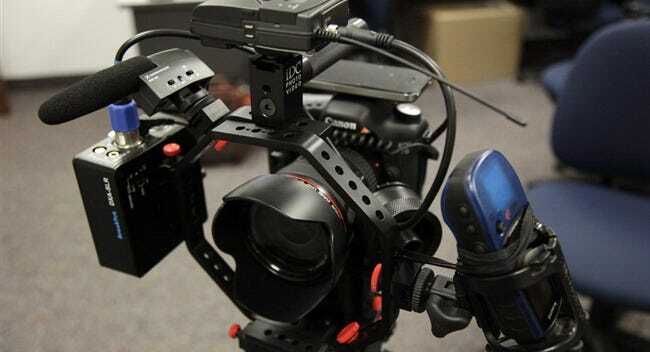 7D DSLR Rig version 1 by Dean Terry, Creative Commons. Canon Digital Elph PowerShot SD780 IS (3) by Studioesper, Creative Commons. Cameras from Large to Small, Film to Digital by Tom Photos, GNU License. The Yosemite 2012 Photowalk by Scobleizer, screenshot from video, Creative Commons.